The Designer Outlet Village in Swindon is housed within one of several restored steam rail engine workshops, originally designed by Isambard Kingdom Brunel. The historic building, built by Great Western Railway, had been derelict since 1986 when 140 years of locomotive manufacture and repair ended. 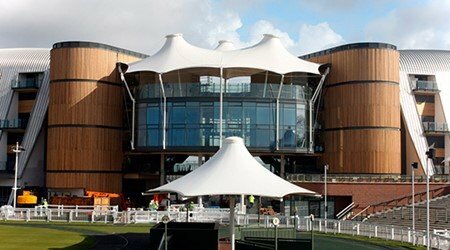 Following a complete restoration and conversion, The Designer Outlet Village opening in 1997 and in 2014 this popular retail and leisure destination underwent a £35million expansion that included redevelopment of the Grade II listed Long Shop. 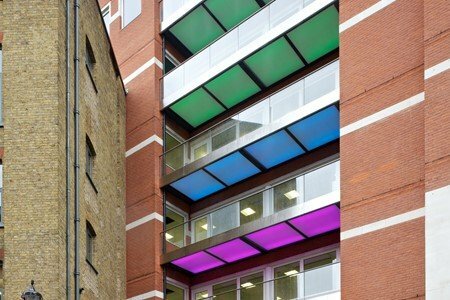 Part of the expansion project included a new crèche and a “Wall Holla” adventure playground in the central courtyard – the first of its kind in the UK. 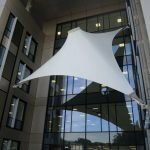 Within the courtyard, a new tensile canopy now stands fixed to the adjascent building, providing shade and shelter over the long, double-height interactive climbing frame. 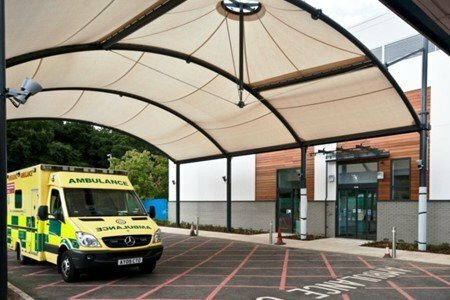 The brief called for a shade and shelter solution over the playground’s key feature, an extra-long double-height climbing frame containing slides, bridges, tunnels and a pneumatic lift. 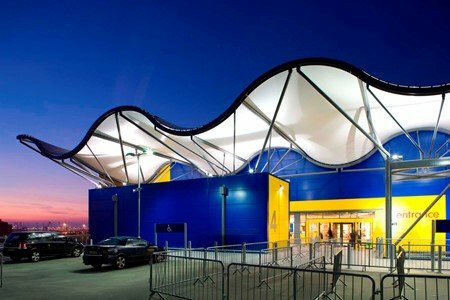 The canopy would need to be sympathetic to its immediate surroundings, weatherproof, in proportion with the Long Shop and not distract from the main attraction – the obstacle-course style climbing frame. 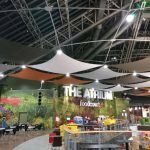 Creating such a practical, yet fun space would attract new visitors to the site and enable the shopping centre to increase turnover. 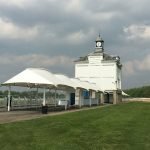 Anticipating the popularity of the climbing frame with children of all ages, the client wanted to provide sun shade and rain shelter for this specific area, so it could be used all year round. 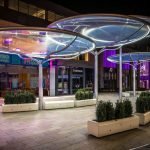 As the play area is also accessed directly from one of the café’s, they knew the canopy would act as additional shelter for grown-ups, so they were looking for as much coverage as possible for their budget. 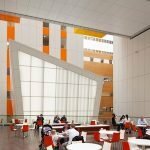 With Fabric Architecture’s engineer and designer working side-by-side, they effectively value engineered the design to produce the most efficient structure possible. 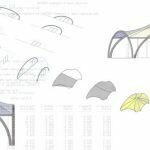 Opting for the low-impact barrel vault shape kept fabric costs down and ensured that the structure (although much taller than the average) did not dominate the space. 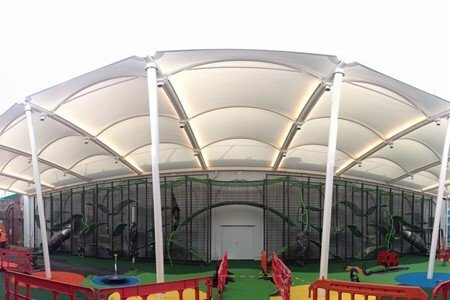 Fabric colour and steel paintwork were kept neutral to tie in with the surrounding steelwork, allowing the vibrant play equipment to shine. 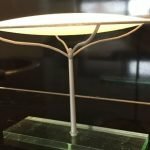 Meanwhile PVC fabric was chosen to provide the best UV protection. 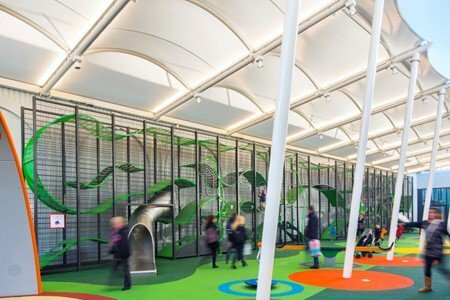 Practical in its provision of all-weather shelter, Fabric Architecture’s 38m long canopy runs the length of the playground following the line of the Long Shop building and covers the double-height climbing frame underneath. 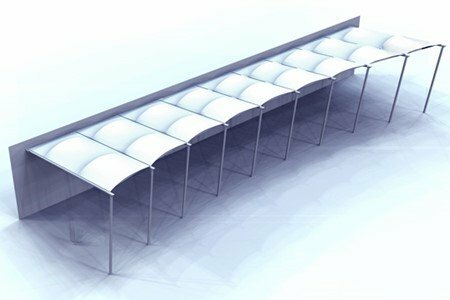 It provides just over 330sqm of shelter, divided across 9 bays and fixed to a series of 3.5m tall legs at the front. 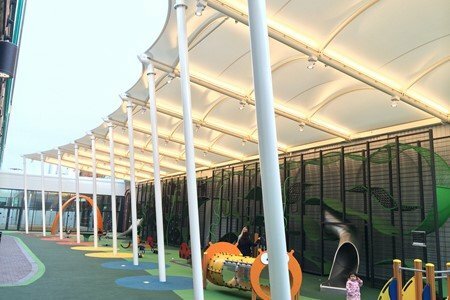 By fixing the back of the canopy to the building with a structural gutter and down pipes, which feed into the existing water management system, FabArc further protected the playground underneath. 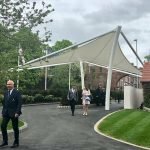 The “Wall Holla” playground was constructed in secrecy behind high fences and being the first of its kind in the UK, has received a lot of press attention since its opening. 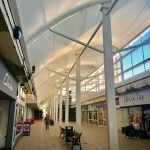 No other shopping centre in the UK provides the same level or quality of services to its youngest customers and this unique selling point is already drawing in greater numbers of shoppers. 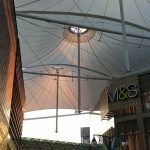 “This contemporary urban playground will cement McArthurGlen Swindon’s status as the ultimate family day out destination in the South West,” said Tina Cumpstey, the centre’s manager. 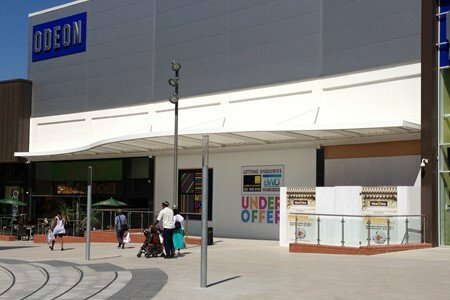 “When we were looking at ways to give Swindon shoppers the ultimate day out, ‘Wall Holla’ was the perfect opportunity to enhance the already fantastic family-friendly offering here. After touring around the world, it’s excellent that Swindon will be the first to host the ‘Wall Holla’ in the UK and we hope it will become an attraction in its own right,” she added.